Home / FAQs / Indian Aviation’s Vision 2040: What are Upcoming and New Airports in India for 1.1 Billion Travelers? India’s Vision 2040 for civil aviation is full of positive facts and practical figures. The phenomenal increase in the total number of India’s inbound and outbound air travelers from 134.98 million in 2015-16 to 184 million in 2017-18 is the foundation of India’s Vision 2040 for 1.1 billion passengers. Recently released at the Global Aviation Summit in Mumbai, the Civil Aviation Ministry’s “Vision 2040” report states that there will be 190-200 functioning airports in India by 2040. Delhi and Mumbai will have three international airports each, while top 31 Indian cities will have two operational airports each. The current fleet of 622 commercial aircraft crisscrossing India (as per March 2018) will grow manifold to include 2359 planes by March 2040. ‘The Next Generation Airports for Bharat’ Nirman Fund (NNF) has been proposed in the report on India’s Vision 2040 to provide monetary support for new and upcoming international airports in India. 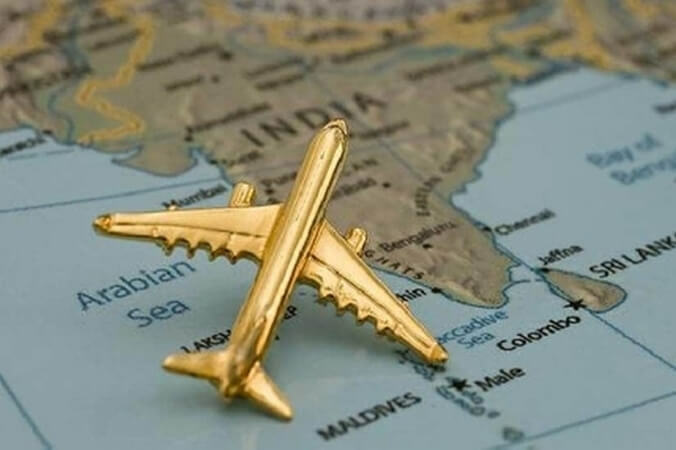 We at Travel Beats, an overseas Indian community portal by Indian Eagle Travel, mined details of India’s upcoming international airports, which are expected to cost around $40-50 billion (excluding land acquisition costs), as per India’s Vision 2040 report. Most of the new and upcoming airports in India will have international connectivity for flights to and from the US, Europe, the Middle East, and Asia-Pacific countries. One of the new international Indian airports under construction is in Rajkot, Gujarat as part of India’s vision 2040 in aviation. Expected to be completed by December 2020, the Rajkot International Airport project secured official approval, environmental clearance and site clearance way back in August 2017. To be developed across 2534 acres of land, Rajkot Greenfield International airport will have the capacity to handle such big aircraft as Airbus A320. One of the upcoming Greenfield airports in India, it will be equipped with solar power system, rainwater harvesting system and a noise-absorbing green belt. Early in 2018, the Airports Authority of India allocated Rs.7.9 billion (USD 125.1 million) for the new Rajkot International Airport project development. Prime Minister Narendra Modi laid the foundation stone during the ground-breaking ceremony in October 2017. Among the under-construction Greenfield airports in India to realize India’s Vision 2040, Mopa Airport will be the gateway to North Goa. To be built in four phases for Rs. 3000 crore, Mopa International Airport will handle 4.4 million travelers on completion of the first phase by September 2020. The passenger-handling capacity of the airport will be increased up to 30 million on completion of the fourth phase. The 78.41-lakh-square-meter airport complex will house an integrated passenger terminal building, a cargo terminal, an aircraft fueling station, air traffic control and meteorological facilities. The infrastructure of the new Goa airport will also include aircraft rescue and firefighting facilities, and a 3.75-km-long runway with rapid exit taxiways. The existing Dabolim Airport in Goa operates at a military airfield owned by Indian the Navy. Goa’s Mopa International Airport is expected to have better infrastructure built by GMR Infrastructure Ltd. that helms the functioning of Hyderabad RGI Airport and Bengaluru Kempegowda Airport. The costliest of all the upcoming international airports in India is Navi Mumbai Airport, which will be constructed in a phased manner from 2019 until 2031 to share the increasing load of air traffic on Mumbai’s Chhatrapati Shivaji International Airport. The Navi Mumbai International Airport project cost is estimated at Rs.16, 700 crore, as per the report on India’s Vision 2040. Deemed as the second Mumbai international airport, it will have topnotch infrastructure including two parallel runways, full-length taxiways, and a world-class terminal built over 2,700,000 square feet. Navi Mumbai Airport will be able to handle more than 60 million passengers per annum by 2031. Reportedly, the NMI airport will handle 80 flights an hour and some 1900 flights in 24 hours. A wing of India’s Vision 2040 for aviation is Noida International Airport at Jewar, which will be catering to the catchment areas of Delhi NCR. Expected to ease the air traffic load on Indira Gandhi International Airport, the new facility will an increasing passenger-handling capacity up to 60 million per year over the next 10 to 15 years. Rs. 10,000 crore is the estimated cost of Noida International Airport at the first phase of construction. A land of 5100 hectares has been identified for Delhi’s second international airport in Jewar, Noida. Much like Delhi IGI Airport, Noida International Airport will have international connectivity for flights to and from the USA, the UK, Singapore, Australia and the Middle East. Of the new Indian airports is Orvakal Airport in Kurnool, Andhra Pradesh. Inaugurated on January 8, Orvakal Greenfield Airport will be catered by low-cost airlines operating domestic flights under Indian government’s ‘UDAAN’ scheme. Bhogapuram International Airport in Vizianagaram is on the list of upcoming airports in Andhra Pradesh. The Bhogapuram Airport project has been given environmental clearance and will be developed at an estimated cost of INR 2260 crore. The government of Andhra Pradesh is eyeing on the development of new Vijayawada Amaravati International Airport that will connect the AP capital city of Amaravati to international destinations far and near. 5000 acres of land has been allocated for the new Vijayawada Amaravati Airport in Mangalagiri. Pune’s second international airport at Purandar will be named after Maratha King Chhatrapati Sambhaji Raje. To be built on 2400 hectares of land, the proposed Chhatrapati Sambhaji Raje Airport may replace Lohegaon Air Force Station, the current international airport in Pune, which cannot accommodate more than 4 to 6 international flights to and from Pune due to restrictions on the air force base. The fate of Pune’s Chhatrapati Sambhaji Raje Airport, though approved over two years ago, rests on the 2019 elections in India. Like Delhi, Mumbai and Goa, Chennai is bracing up for a second international airport in line with India’s Vision 2040 for aviation. Intended to decongest Chennai International Airport (MAA), the second facility requires around 2000 acres of land. Cheyyur, because of its proximity to the scenic East Coast Road, is under consideration for Chennai’s second international airport by Tamil Nadu government. Cheyyur is about 100km south of Chennai. The civil aviation ministry is mulling over plans to build an aero city around the proposed second international airport in Chennai for 40 million travelers a year. One of the upcoming international airports in India will be located in Ludhiana, Punjab’s largest city and industrial hub. 134 acres of land in Halwara, a 32-km drive from Ludhiana City has been earmarked for the project. Approved by the Punjab Cabinet, Ludhiana International Airport will come up at the existing Indian Air Force (IAF) station in Halwara. To be developed by the Punjab government and the Airports Authority of India in collaboration, the project includes construction of an international civil terminal in the first phase which is expected to be completed in 2022. The upcoming Ludhiana International Airport will be able to accommodate and handle Code 4C-type aircraft such as Boeing 737-700 and Airbus A-320. It will share the increasing load of air traffic to Amritsar International Airport in Punjab. Good news for the Sabarimala pilgrims from across the world! Recently approved based on a techno-economic feasibility report, the Sabarigiri International Airport project will be developed using 570 acres of land at Cheruvally Estate near Erumely in Kottayam district. The only hindrance is the difficulty to obtain environment clearance for the proposed location of the Sabarimala airport. If things fall in place as planned, Sabarigiri International Airport will be the nearest airport for Sabarimala and the fifth international air travel hub in Kerala. Currently, Cochin International Airport is the nearest airport to Sabarimala at a distance of 155 km. Pilgrims have their fingers crossed hoping that Sabarimala Airport should not meet the fate of the Aranmula airport project which the National Green Tribunal disapproved due to environmental concerns in 2014. How many airports does Maharashtra have? There are 14 airports (three of which are international), including the newest Sindhudurg Airport at Chipi Parule near Malvan. Recently opened for commercial flights to and from Bangalore and Mumbai, Sindhudurg Airport provides seamless access to the Konkan region comprising parts of Maharashtra, Karnataka and Goa. Located 25km from the Mumbai-Goa highway, the airport is at a short drive of 20km from Tarkarli Beach, the most popular diving site in Maharashtra. The driving distance to North Goa’s beaches, such as Arambol and Mandrem, from Sindhudurg Airport is only 60km. Of the new Airports in India, Sindhudurg Airport makes way for scenic road trips in and around the Konkan region. One of the new Indian airports under construction is Hollongi Airport in Itanagar, the capital of Arunachal Pradesh. To be located some 25km from Itanagar, Hollongi Airport will cost an approximate Rs. 1200 crore for the infrastructure better than that of Pakyong Airport in Sikkim. The upcoming Itanagar airport will spread over an area of 320 hectares and have a 2200-meter long runway for jet aircraft. The Hollongi Airport project includes a 5-start hotel, a world-class convention center and other such facilities. Since Hollongi Airport will provide easy access to the state capital, it will be connected to other state capital cities with direct flights. On demand, Hollongi Airport can connect Itanagar with popular destinations in neighboring countries.